The biggest shopping frenzy of the season is upon us! Are you ready? 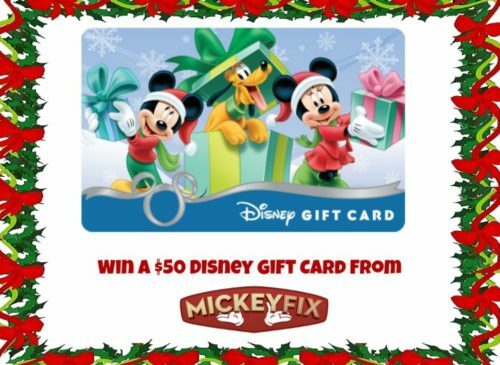 To help you out for the holidays, we are giving away another $50 Disney Gift Card – we’re sending it to the winner electronically so they can start using it right away! The giveaway will end on November 22nd, 2017 at 11:59 pm. The prize will be provided by Mickey Fix. We will confirm that you are a subscriber of the Mickey Fix newsletter. Mickey Fix is not affiliated with the Walt Disney Company or its subsidiaries. I’m a subscriber and follower. Good luck everyone! Became a subscriber. Love all things Disney!! I currently subscribed to the newsletter! Please enter me into the giveaway. Thank you! Visited FB page. Thanks for the opportunity! I already follow you on Twitter but please give me another entry. Subscribed, liked on facebook and Followed! Yay! What a great post! Visited the Mickey Fix Facebook page. Followed on Facebook and liked the post! I have visited and likes your Facebook page. Visited and already follow on facebook. I visited on Facebook & liked! I subscribed ! And commented on the Facebook post! Also liked facebook page and post! Followed on twitter and favorited tweet! I am already a subscriber to Mickey Fix! Subscribed – follow on fb and twitter! Need for our family vacation to Disney! Followed on Twitter, too! Thanks for the giveaway! I’m following. I hope to win. I will use it for our trip in April. going in January to see Mickey!! I actually learned about this giveaway from your FB page that I already follow. I’m now following your page on Twitter. Liked and following on FB! Have been a member for a while. LOVE ALL DISNEY! Following on MickeyFix on Facebook!!!!! !